Apple today released watchOS 5.1.1, an updated version of the Apple Watch operating system that fixes several bugs. The new software arrived less than a week following a botched watchOS 5.1 beta that was pulled last week after it was found to brick some Series 4 units. The new watchOS 5.1.1 software carries a build number 16R600. 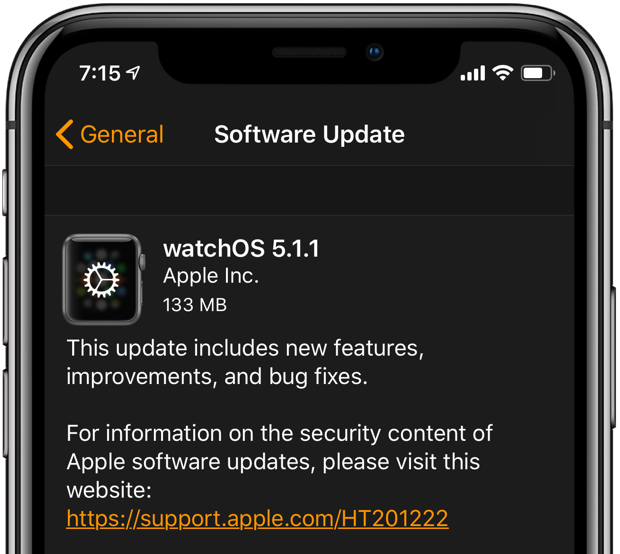 According to the changelog, the watchOS 5.1.1 software update packs in the same fixes as the original watchOS 5.1 beta that got released then pulled last Tuesday. There are fixes for an Activity medal issue, Walkie-Talkie and fall detection alerts. For details on the security content of this update, read Apple’s support document. watchOS software updates can be downloaded by tapping My Watch → General → Software Update in the companion Watch app on your paired iPhone. To install the update, your watch must be on its charging disk and in range of your iPhone which must be connected to Wi-Fi. Some features may not be available for all users. Apple maintains a per-country availability list of the biggest Apple Watch features on its watchOS Feature Availability webpage.